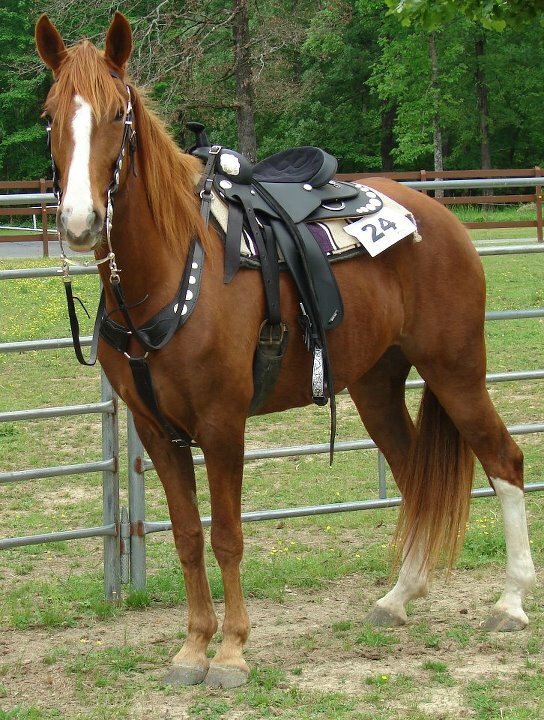 A look at some of the most horrible examples of horse equipment on the market today. Please remember, this blog is simply MY opinions. Everyone has some and like armpits, some stink! It is all subjective anyway. I am not telling anyone what to use at all. I am just making observations and stating my own likes and dislikes. If you do not agree, fine, you are entitled. THERE IS NO ONE RIGHT WAY. Please, read and enjoy and try not to be ugly to others. Everyone has a right to their opinions. I has a conumdrum....my gelding, Sonny, AKA Goober, has a saddle fit issue. I CANNOT seem to find an English AP or CC saddle WIDE enough for him. This horse does NOT look as wide as he is, but he takes a full QH bar with a nearly 8" gullet! I have a Wintec 2000, and have the widest gullet in it that comes with the regular kit, but it STILL causes issues, the panels are that thrice-damned CAIR stuff and the channel is too narrow. With the wide gullet it now rides DOWNHILL on an already slightly downhill horse. SO, anyone have any ideas? Anyone found a good saddle that will fit a TRULY wide horse? I have been eyeing this saddle from Schneiders, but I still have my doubts that it would even remotely fit. I would LOVE to try it out to see if it passes muster. The saddle is BEAUTIFUL, and if it is as good a quality as it LOOKS and claims, it would be well worth the price. They have a lot of nice specialty items for wider horses like Arabians and QHs, so I am thinking it might would work. Anyone out there ever tried one? So, Schneiders, what say you? Well, as some of you know from the FB post, I lost my beloved mare Fatima (AKA the SRF) August the 24. She died of a massive reaction to a progesterone injection. She began to seize the evening before, as soon as I began to give the injection, it scared me to death. I stopped and did not give her the whole thing. I called the vet (two vets actually) and they told me it sounded like I had accidentally gotten some of the medication in an artery when she started to squirm around and she would be fine in a bit. She seemed to come out of it and recover and was up and walking around when we left the barn. At nine o'clock at night the barn owner texted me and said she was still doing fine, wandering around and grazing. At 4:30 Friday morning I got a call telling me that she had crashed through the fence and then onto the barn owner's back porch, breaking a window. Apparently she went through another fence into the back pasture, which is where she was when we got there. She was completely neurologic, she would go into a seizure, fall, thrash, smash her head on the ground and then go still for a bit, resting, then she would attempt to get up and start all over. We got two halters on her and managed to keep her from smashing her head into the ground as much. The closest vet would not answer the calls, and my usual vet was an hour and a half away. She got up and headed our way, but in the interim we had to deal with the repeated seizures. The interval between them got longer, but they were still happening. When the vet got there, she sedated her and began IV fluids laced with Dex and DMSO to try to reduce the swelling that had developed in her brain. She finally lay quietly and was resting after the fluids were administered. The vet left another bag of fluids and a sedative for me to administer a bit later. I am a vet tech and have had the training to do these things and my vet knows my abilities and had it not been me she would not have trusted me with this sort of thing. She had inserted a jugular catheter, and sutured it in. She told me that she was not going to lie to me, and that she could still not make it. I understood, I know that a horse surviving something like what she had gone through was iffy at best. My best friend and I stayed out in the pasture with her, watching her for any signs of coming out of it. After about an hour or so, she seemed to begin to seize again. Her breathing became very labored, her nostrils collapsing, and she was gasping. I called the vet back and she said to re-sedate her. I did and she continued to take what turned out to be her final breaths. She had no response to stimulus. I was holding her nostrils open and trying to get her to breathe again, my friend was also calling to her and trying to get her to respond, but she was gone. We let my friend's gelding, who loved my mare, say goodbye before we loaded her on the trailer and took her home. It was the longest drive I have ever made. On our way we say a beautiful, full rainbow, I like to think that was her, crossing over, saying goodbye. When we arrived back at the farm I grew up on and she was born on, we drove her to the back pasture and laid her to rest beside her mother. They are together now. This has been the hardest thing I have ever had to do. I miss her so much. I had such hopes and dreams for us. Part of me still can't grasp the fact that she is gone. Love your horses folks, love them with all you have, you never know when your time with them will be gone. It is designed as an open group for everyone to post photos of Tacky finds, torture devices, horrible misuse of "hardware", etc. for discussion. I ask for no sales ads or trolling. If we can't play nice, mommy will shut it down. 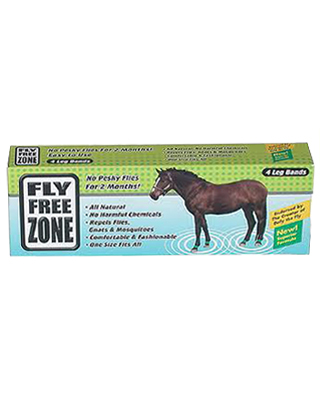 Fly Free Zone leg bands are the bomb! Let me tell you, my gelding apparently tastes like candy to the flies and they would leave his poor white legs all chewed up and bloody. I used fly spray, but it only worked for a little bit. I bought a set of these leg bands by Fly Free Zone (they make neck bands too) and bam! No more chewed up legs. They are basically a Velcro band that you attach around your horse's lower leg. They contain a sponge soaked in a mixture of Citronella oil and fly repellent. Now, they do dry up eventually, but I discovered that I could soak them with my fly spray and some Citronella essential oil every week or so and they work good as new! Schneider's also carries the collar, which is excellent for keeping those deerflies from buzzing their ears. 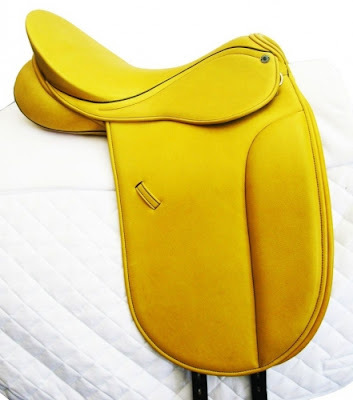 So guys, I was contacted by Schneider's Saddlery to do some product reviews and features here on the blog. They have great prices and a wide variety of products. This week I am featuring a product that they carry and I own. I had been looking for a new western saddle for some time. The one I used to show last year was one I bought when I was 11 years old. Needless to say, I have outgrown it. I could still fit the seat, but the stirrups were hung WAY too far back. It killed my knees to ride it. I decided to get a Wintec western saddle to replace it. I went with their square skirt model in black. I have had a Wintec English All Purpose with the interchangeable gullets for a couple of years, and before that I had an early model Wintec 2000 that I rode for YEARS. I loved that saddle, so needless to say I had complete faith in the Wintec brand. 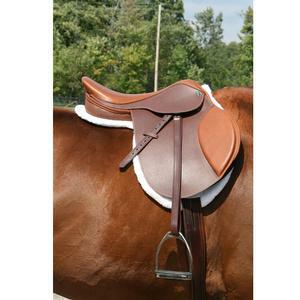 When the saddle came in, I was pleased with the quality and the weight. My old saddle had been a heavy roping saddle, and I wanted something easier to lift and carry. My only complaint was the plastic stirrups and that was easily remedied. Since I planned to use it to show, I decided to dress it up a bit with some conchos from Tandy Leather and some new blackened, etched aluminum stirrups. I also got a cheapo plain leather bridle off of eBay, an undyed leather buckaroo style breastcollar. I already had a set of reins I could use as well as a pretty bit. I dyed the bridle and breastcollar and added silver to them as well. Here is the result. Pretty nice, eh? Does that not sound like the perfect name for this thing? Mikmar's new invention looks like something out of a sci-fi movie. The mouthpiece, though substantial and somewhat overkill, does not appear THAT severe, but dang, if that sucker goes in the horse's mouth like I think it does, can we say jawbreaker? A "BEST SELLER" for Barrels and Gymkhana. The Mikmar Short Shank Gagavator is a quicker activating bit that allows the rider a quick pick up and release ride. It is excellent for lifting the shoulders and lightening. Works well for developing bend and flexibility. It encourages flexion, collection and good control. It discourages the horse from leaning and pulling, with excellent rate or half halt. A nice tool for helping the horse transfer weight to the hind quarters, and getting underneath himself for better turns. 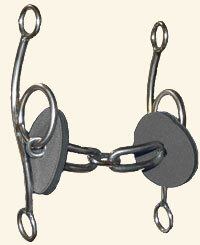 The Sweet Iron mouthpiece pacifies a busy -mouthed horse and keeps the mouth moist and soft. 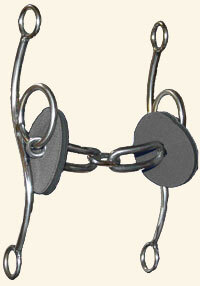 The Short Shank Gagavator offers more poll pressure and stop than the Two and Three Ring styles. Works well for all level horses. We recommend using a leather curb strap for bit stability. The Mikmar Long Shank Gagavator offers stronger Poll pressure and more control for those needing it. Works well for stronger level horses. We recommend using a leather curb strap for bit stability. Yikes. Forget teaching your horse to stop, or carry themselves, or collect. Just slap one of these on and problem solved!! Click http://www.mikmar.com/bit-pages/gagavators-PS.html to see a video of how they fit/work. And yep, they do go on like I thought. Add curb strap and holy cow. Labels: Bits-n-Pieces, Training or Torture? Email your ideas and tacky finds!! Note: if you are sending something from Craigslist, please email me the actual photo, I cannot view Craigslist from my computer. Thanks.